This MAP Analysis is a preview of the author’s forthcoming article in the January issue of Asia Policy. Coping with “gray zone” situations has in recent years become the core security challenge for Japan. Since September 2012, Beijing has been challenging Japan’s sovereign control of the Senkaku Islands by regularly sending law-enforcement vessels into Japanese territorial waters and contiguous zones. Beijing sends civilian or paramilitary forces to change facts on the ground while daring the targeted country to use force to stop these activities. These incursions, which do not amount to an armed attack, are blurring the line between crime and defense, law enforcement, and military activities. In August, an armada of 230 Chinese fishing boats, accompanied by 7 Chinese Coast Guard (CCG) vessels, was spotted near the Senkakus. This could have led to a nightmare scenario for Tokyo in which the disputed islands are seized by Chinese armed fishermen. 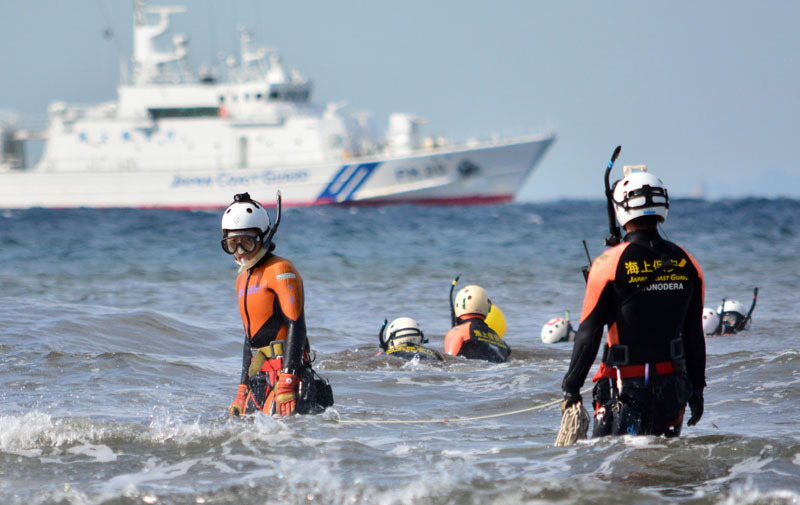 Such a situation could quickly escalate with the arrest of the intruders at sea by the Japan Coast Guard (JCG) or on land by the police forces, followed by the deployment of Chinese naval vessels to rescue its citizens. The Japan Maritime Self-Defense Forces (JMSDF) could then be deployed on site, on the request of the Cabinet Office, only with limited authorization to use force (law-enforcement powers). This chain of events would create a tense standoff between JMSDF and Chinese naval vessels with a high risk of developing into a military incident. The dilemma for Japan would be to choose between being the first side to use force to displace the intruders and leaving them alone with the risk of Beijing claiming actual control of the islands. In this kind of scenario, a clear division of roles between the JCG and JMSDF, with the early involvement of the latter, would ensure a greater deterrence effect and a swifter and consistent response in case of an intrusion. The JCG is a civilian law-enforcement agency that was created in 1948 after the U.S. Coast Guard model. Its constabulary missions have increasingly touched on national security issues as incursions into Japanese waters, especially by North Korean and Chinese governmental vessels and fishing boats, become more frequent. Since 2000, the JCG has been allowed, under certain conditions, to stop suspicious ships with direct fire. This led some experts, such as Richard Samuels, to describe the JCG as a “fourth branch of the Japanese military.” However, even today, the status, mission, budget, and capacities of the JCG are still clearly distinct from those of the JMSDF. Indeed, the JMSDF has a budget of 1,200 billion yen ($9.9 billion), which is over five times the size of the JCG’s budget, and includes 45,500 personnel (compared with 13,422 for the JCG) to defend Japan’s maritime domain and engage in noncombatant operations overseas. Accordingly, the JMSDF patrols Japanese waters with vessels and airplanes and replies to warship intrusions. It also supports the JCG when the latter cannot adequately respond to contingencies. 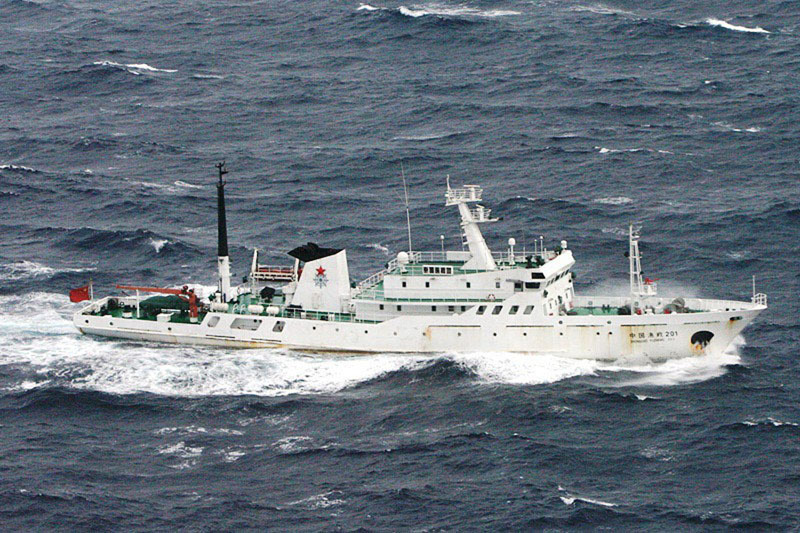 A Chinese fisheries patrol ship, the Yuzheng 201, sails near the Diaoyu/Senkaku Islands on November 20, 2010. This photo was taken by the Japan Coast Guard. JIJI PRESS/AFP/Getty Images. In gray-zone situations, civilian or paramilitary forces are used to change facts on the ground while taunting the target country to eventually use force to halt these activities. Such tactics, which do not amount to an armed attack, have been identified by Tokyo as a threat since 2010 and have informed the transformation of Japan’s defense posture. The government is organizing a “dynamic joint defense force” and has redeployed troops onto the Ryukyu Islands, on the southwest of the archipelago close to the Senkakus. Moreover, official documents are calling for more cooperation and coordination between the JMSDF, on the one hand, and the JCG and police forces, on the other, which until recently have been isolated from one another despite playing complementary maritime roles. Why Is There No Legal Structure for Cooperation between the JCG and the JMSDF? The question of coping with gray-zone situations was supposed to lie at the core of the security legislation passed by the Shinzo Abe government in September 2015. However, the series of laws ultimately adopted did not directly address the issue but instead focused on the limited use of the right of collective self-defense. 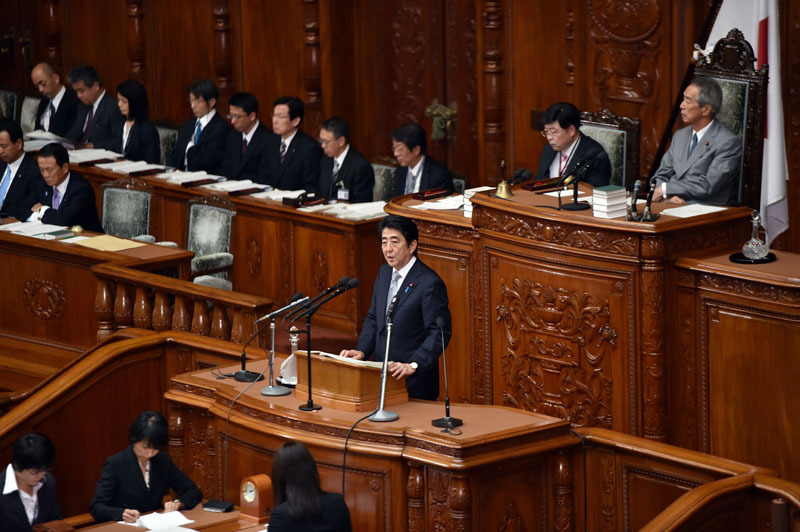 Japan’s Prime Minister Shinzo Abe delivers his policy speech to the Lower House of the National Diet in Tokyo on September 29, 2014. YOSHIKAZU TSUNO/AFP/Getty Images. In 2014 the Abe government actually discussed formulating a legal arrangement to help redefine the respective responsibilities of the police, JCG, and JMSDF when dealing with gray-zone situations in order to ensure smoother interagency cooperation during peacetime. These negotiations did not lead to legislation, however, mainly because of the competition between agencies to protect their respective missions. In particular, the JCG, a purely civilian agency according to Article 25 of the Japan Coast Guard Law, resisted expanding its mission to encompass more “paramilitary” activities. Political reasons also played a role in the decision to shelve the legal option, as the New Komeito (a junior member of the ruling coalition) argued that most gray-zone scenarios could be handled by the JCG using law-enforcement measures alone. The case for a legal arrangement was later raised by the opposition parties. In summer 2015, the Democratic Party of Japan and the Japan Innovation Party jointly proposed a “territorial security bill” (ryoiki keibi hoan) defining priority zones in the East China Sea in which the JMSDF would assume primary responsibility for patrols and defense. Yet this bill was rejected on the grounds that it would have the effect of pinpointing the weaknesses, or “soft bellies,” in Japan’s territorial defense. In the absence of a legal framework, there have been many calls for greater operational coordination between police, the JCG, and the JMSDF. The second question related to legal issues and procedures is the nature of JMSDF intervention in gray-zone situations. When the JCG cannot manage a gray-zone situation, the JMSDF can be sent in for support. In such cases, as no proper military attack has taken place, the JMSDF does not take “orthodox military action” (boei kodo). Instead, it conducts “maritime security operations” (kaijo keibi kodo) in support of the JCG according to Article 82 of the Self-Defense Forces Law. Under this order, the JMSDF can use weapons under the strict conditions outlined in the JCG Law. To date, such an order has been issued by the Prime Minister’s Office only three times: in 1999 to chase a suspected North Korean spy ship, in 2004 in response to the incursion of a Chinese submarine in Japanese territorial waters, and in 2009 to allow the JMSDF to conduct antipiracy operations in the Gulf of Aden. 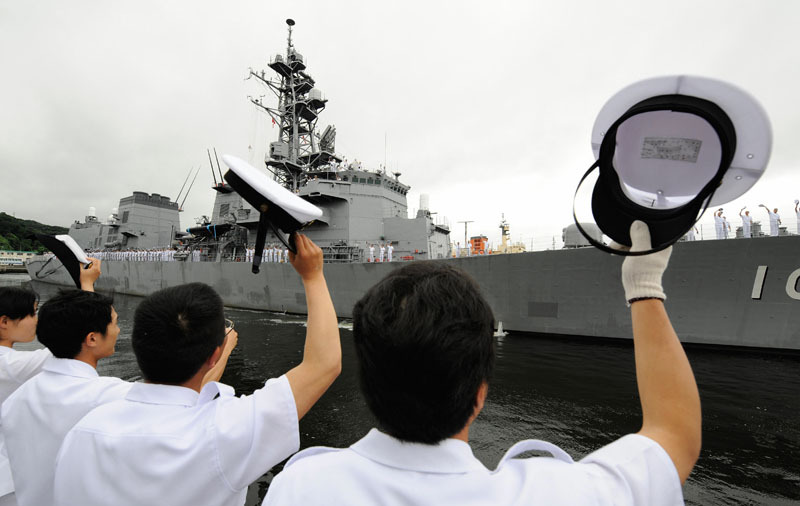 Officers of Japan’s Maritime Self-Defence Force at the Yokosuka base, Kanagawa prefecture, see off the destroyer Harusame on July 6, 2009, as the ship begins a deployment in the Gulf of Aden. TORU YAMANAKA/AFP/Getty Images. This specific order follows from the characteristics of Japan’s defense policy: the missions and activities conducted by the Japan Self-Defense Forces (JSDF) are described in a positive list, which is much more restrictive than the negative list that limits most other countries’ military activities. While the Japanese government considers maritime security operations to be another layer of law-enforcement operations conducted by more capable forces to prevent a military escalation, China does not share this understanding and would consider any intervention of the JMSDF in a gray-zone situation as a unilateral military escalation by Japan. That is why China’s strategy of “reactive assertiveness” presents such a challenge: Japan must respond to a gray-zone situation using a black-and-white security system in which optimal coordination between the JCG and JMSDF is difficult to achieve. The government nevertheless tried to facilitate the procedure to ensure a smooth response by the JSDF, if needed. Since May 2015, only a phone call from the Cabinet Office is needed to authorize intervention by the JSDF. However, some experts and practitioners believe that the rules of engagement under Article 82 of the Self-Defense Forces Law may not be broad enough to retake control of the situation in a gray-zone emergency, nor even have a real deterrent effect. Because the JCG and JMSDF are different in nature, there has not historically been a culture of close cooperation and coordination between the two institutions. However, this has gradually changed, especially after the episodes in 1999 and 2001 when North Korean spy boats entered territorial waters. The JCG and JMSDF subsequently adopted a manual to set up procedures for joint responses to such scenarios and engaged in joint training. Another important step toward improving people-to-people relations was the government’s decision to allow JCG officers onboard JMSDF ships to conduct antipiracy operations in the Gulf of Aden. Such cooperation has been ongoing since 2009. In July 2015, the two forces held their first joint training on a gray-zone scenario, although the exercise was limited to law-enforcement activities. More recently, on November 11, the JSDF, JCG, and police forces conducted their first joint drill to cope with illegal entry of armed fishermen on a remote island. Another factor that has improved mutual understanding between JCG and JMSDF counterparts is the evolution of the JCG’s governance since 2013 to allow officers, instead of civilians from the Ministry of Land, Infrastructure, Transport and Tourism (MLIT), to hold the top post of commandant. In addition, the JCG and JMSDF have adopted an information-sharing protocol and now exchange information on a daily basis between the two corps. They are also setting up a framework for coordination both at the operational level and between regional commands. This framework has helped manage Japan’s daily interactions with Chinese boats around the Senkakus. 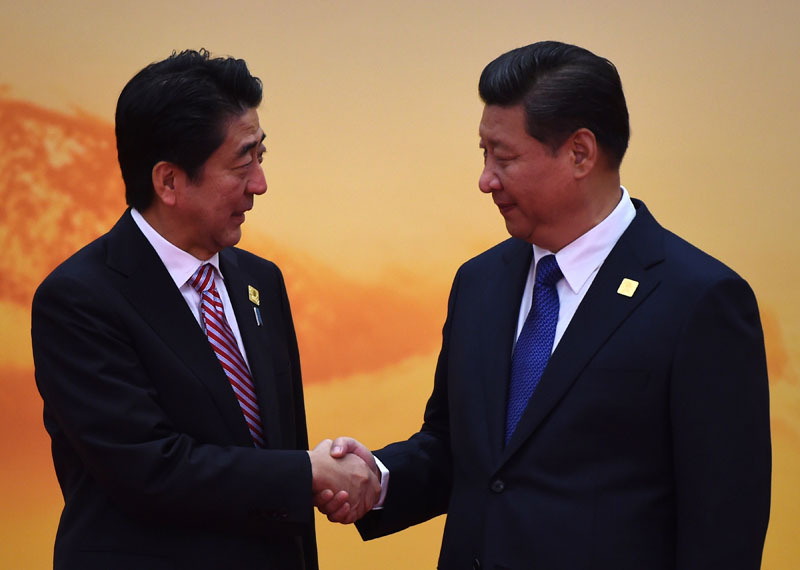 Since October 2013, and more resolutely November 2014, when Abe and Xi Jinping agreed to meet, the situation has been stabilized by the relative routinization of interactions between the two coast guards according to a 3-3-2 formula: three CCG ships enter Japanese waters three times a month for up to two hours each visit. Nonetheless, since the episode of the Chinese fleet passing near the Senkaku Islands last summer, the CCG’s routine seems to have changed to a 4-3-2 formula: four ships have been spotted three times a month in Japan’s territorial waters, lingering for up to two hours. Japan’s Prime Minister Shinzo Abe shakes hands with China’s President Xi Jinping at the Asia-Pacific Economic Cooperation (APEC) leaders meeting at Yanqi Lake, north of Beijing, on November 11, 2014. GREG BAKER/AFP/Getty Images. As they observe the developments in the South China Sea, Japanese officials are anxious about the possibility of a future coup de force, especially as CCG capacity is growing at a rapid pace. From this perspective, the current level of coordination between the JCG and JMSDF is still not high enough and many challenges to deepening cooperation remain. According to Japanese experts on maritime law enforcement, the JCG and JMSDF could take a number of steps to improve collaboration. First, they could update their communication systems and secure channels. As identified in 2011, civilian and military units typically do not use the same equipment to communicate. The hardware, software, and procedures of the JCG are particularly outdated when compared with the JMSDF’s systems. Second, the two fleets do not share technology for maritime domain awareness (MDA), which limits their scope for coordination and prevents anticipation and understanding of a deteriorating situation. Sharing this technology would allow for fully integrated, comprehensive MDA. Third, a common unified C4ISR (command, control, communication, computer, intelligence, surveillance, and reconnaissance) system is being developed to serve the three branches of the JSDF (Ground, Maritime, and Air). Plans should be made for a similar JCG upgrade. Fourth, the JCG and JMSDF need to engage in more joint exercises and training to ensure smooth joint operations should a gray-zone situation worsen. One important challenge to address is that the JCG and JMSDF do not share a chain of command and control. Another measure for consideration would be the integration of the JCG within the security governance institutions. As part of the MLIT, the JCG is represented to a certain extent in the National Security Council, but its association with the alliance coordination mechanism with U.S. forces is still under discussion. A Japanese Coast Guard marine rescue unit searches for typhoon victims off Oshima island, 120 km south of Tokyo on October 18, 2013. KAZUHIRO NOGI/AFP/Getty Images. Finally, most experts and practitioners concur that Japan needs to replace existing JCG boats with more modern ships. Estimates suggest that around 35% of the 366 JCG patrol boats, built in the 1970s and 1980s, are outdated. Moreover, 50% of the JCG’s ships will need replacing in the next five years. In April 2016 a budget was passed to replace 15% of the outdated vessels, but in the years to come shipbuilding must accelerate—a job that could be outsourced with preferential conditions to Japan’s maritime partners in Southeast Asia. A thorough discussion should take place regarding the fundamental need for Japan to adopt a “whole of government” approach to regional security. Indeed, improving the country’s current security posture depends much more on implementing such an approach than on revising Article 9 of the Japanese constitution. Breaking down bureaucratic stovepipes to create a culture of coordination is no easy task and has met with fierce resistance not only in Japan but in numerous other countries. The preceding discussion has identified several steps that Japan could take to begin this process of improving cooperation between the JCG and the JMSDF. Céline Pajon is a Research Fellow at the Center for Asian Studies in the Institut français des relations internationales (Ifri, or the French Institute of International Relations). Banner image: © TED ALJIBE/AFP/Getty Images. Japanese Coast Guard ship PLH02 Tsugaru is seen past a cargo vessel during an exercise off Manila Bay on July 13, 2016.